Today was the first day that actually felt like fall. I don’t mean like a specialty coffee… I mean hooded sweatshirts, warm blankets, steamy bowls of soup and the sound of rustling leaves. And if you are lucky, you can enjoy all of those things at the same time. Tonight’s Crock Pot Creamy Potato Soup made me think of Friday night football games in high school. And cold walks on first dates. And craving ice cream on a cold winter’s night. It’s like everything that it supposed to feel cold on the outside, but makes you feel warm on the inside. That’s how satisfying this soup tastes. 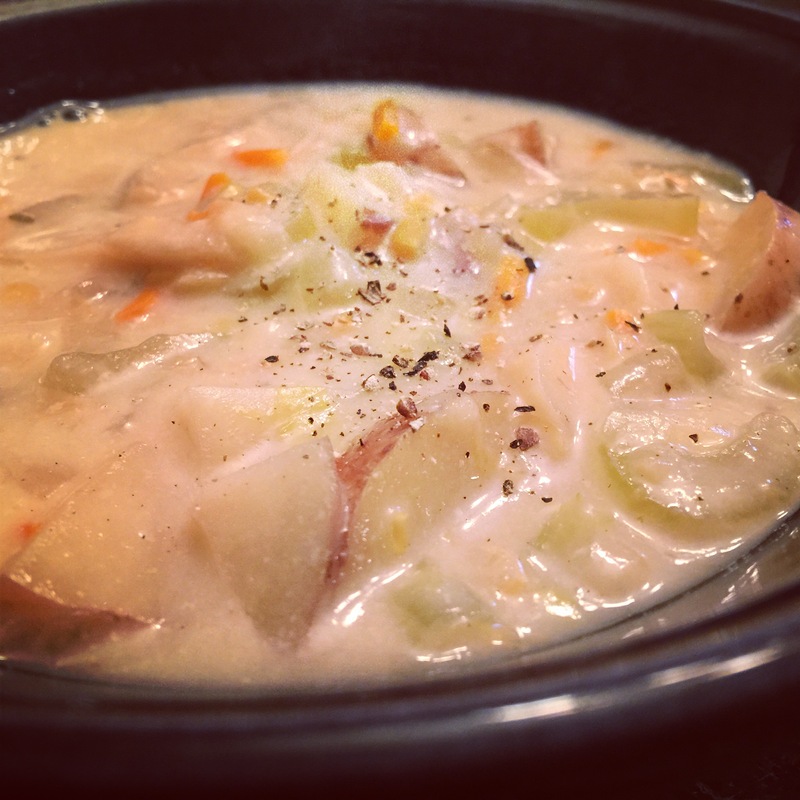 So I’ve already posted another version of Crock Pot Potato Soup already, but I like this one because it includes more vegetables. I’ve also posted Crock Pot Parsnip and Potato Soup because parsnip is my second favorite root vegetable. (Bonus points if you know what my favorite is!) I also have Crock Pot Sweet Potato and Corn Chowder, if you prefer the orange to the white. I’m sensing a theme here! I do love potato soup and each recipe is tweaked a little different. I feel like tonight’s Crock Pot Creamy Potato Soup is actually a culmination of my favorite things from each of these recipes… but I encourage you to mess around and figure out what your palate prefers with your potatoes. Clean and prep all vegetables and add to the pot. Add broth and seasonings and give it all a good stir. Do not add milk or corn starch yet. Cook on low for 6 hours. Add corn starch to milk and dissolve, then add to the pot. Cook on high for one additional hour. Remove lid and let soup thicken a little bit before serving.